When the selection comes to stick or upright vacuum cleaners, the luxurious two brands stand with dignity and they are the Shark and the Dyson. There may be so many great products of different brands but Dyson and Shark are the two favorites in all probability among the other top-notch brands in the market. None of these brands of vacuum are cheap rather they are among the most luxurious vacuums of these days. 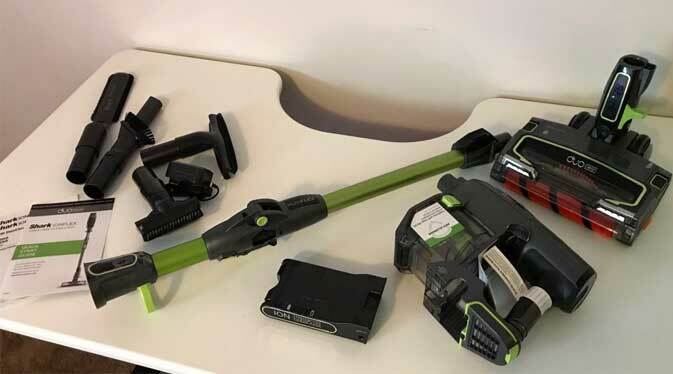 If you keep an eye on the corded vs. the cordless vacuum cleaners alternatives, you will pay a little more for the vacuums that are battery-powered regardless of the brand. So, this makes Shark and Dyson the two leaders of the vacuum cleaners world. We can see a lot of people who are ready to pay additional charges for these machines and this has already been proved by their popularity. But, before you invest a handful amount of money on buying the perfect vacuum cleaner, we are here to help you out. Bin Volume	 8.7 lbs. 5.75 lbs. 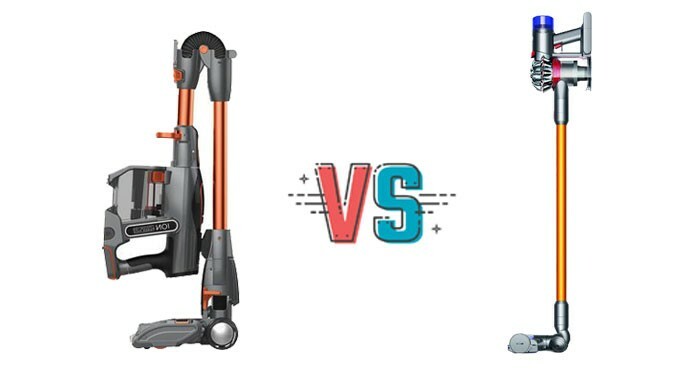 To select one vacuum cleaner between Dyson v8 and Shark IONFlex will be really tough as they are both incredible cordless cleaners. The costs of both cleaners are more or less equal but the features they bear vary. Choosing any vacuum cleaner as the best vacuum cleaner depends on your requirements. Shark has a very simple design and it makes the work of emptying the bin easy. It has no cylindrical mesh filter positioned in the center and so the dirt can easily be dropped down without any obstacles. Nevertheless, the IONFlex has a small bin design which is of 0.33 liters. For this reason, you will need to empty the bin frequently. Bin is one of the most important issues and the older models of Dyson have bins that are awfully messy when it comes to emptying them. Those bins rely on the gravity only and that makes it tough to empty. However, the new V8 model of Dyson has solved the previous problem. It has a shroud for pushing the dirt down. The second thing we are going to talk about is the interface and ergonomics of the vacuum cleaners. Comfort is a matter when you are going to choose one vacuum cleaner. Both of the motors of these vacuum cleaners are set on the top of them and so you have to understand that they will be top heavy. You will require a little strength while cleaning the above floor with these vacuums. If you cannot provide arm strength then cleaning above-floor will not be perfect. But, these machines are light and so cleaning the floor will be unproblematic. Both of these machines will provide you the dual speed settings and they also have the washable filters. But the manner of accessing these features is different than each other. The IONFlex model of Shark has got so many neat tricks to keep the device more efficient. 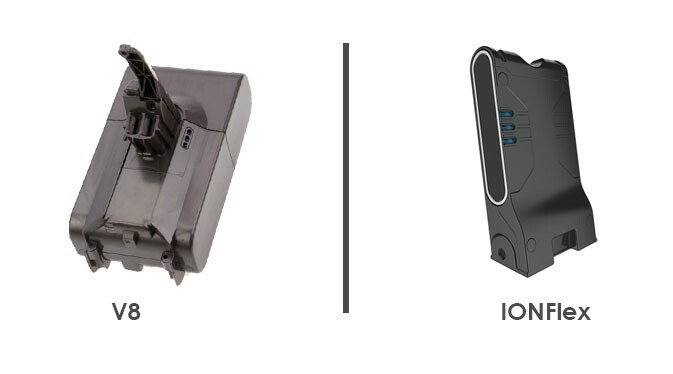 You will find some notable differences if compared to the Dyson in terms of its power switch. Instead of using a trigger, Shark basically uses a button as the main button and other speed settings. The other big plus point of Shark is it does not require squeezing something constantly. During cleaning any vehicle this feature will provide you a huge advantage. Like the previous cordless models of Dyson named as DC35, DC59, DC44, V6, etc. the V8 has utilized a trigger mechanism. This mechanism needs to squeeze continuously for keeping the function of the vacuum running. Up until the Dyson V6 model, all of the cordless modes had a push button for activating the max suction. Though the button will not be a major issue some people may feel turning on and off the button annoying. The customers of Dyson have already been telling the brand about their flow in the design and so the brand has taken initiative by launching the V8 model. In this model, Dyson has no button for activating. Instead of the button, the V8 has a slide switch now which has made it simple to toggle between the max and normal suction. When it comes to the attachment section, both of these vacuum cleaners are amazing. The versatility of Shark IONFlex and Dyson V8 will blow your mind up. Thanks to tools that are interchangeable as both of these cleaners can be used as handheld or stick method. While both of the vacuum cleaners offer you the identical tools, there are variances in their designs. Let us start with Shark IONFlex. This vacuum cleaner comes with some similar toolset just like the Dyson v8 but the brand uses some unique twists. ION Flex TechnologyFirst, we will talk about the extension wand. Unlike other vacuums, Shark does not only bear an aluminum tub rather the wand of Shard includes a rubber which is inserted in the middle. This feature will help you to bend this cleaner and make it easy to clean if you are cleaning under the furniture. The brand named this the “IONFlex” Technology. The other benefit of this brand is the storage. You can easily bend the cleaner and can store this in an upright position. This will help you eliminate the requirement for the wall mountable bracket. The other unique feature that Shark possesses is the DuoClean tool. This tool combines the bristle brush and the soft roller. This is a hybrid tool that has the combination of Dyson’s motorhead tools and the soft rollers. The brand does not only carry the DuoHead technology but Shark IONFlex also bears the feature of LED headlights. This helps in terms of visibility during cleaning the dust under the furniture. More than the previous models of Dyson, the v8 bears some absolutely variant technologies. We will present 6 different technologies that this model bears. All of these tools can be used on both on the vacuum motor and the wand. You can clean virtually in any place inside your home and it will clean your home just like the wet stuff does. You will also get an optional hose attachment with this vacuum cleaner (you have to purchase separately.) This will aid you in cleaning the tight areas inside the vehicles. If you charged the battery fully then the Dyson V8 will run up to 40 minutes (without the motorized attachments.) If you use the motorhead or the soft roller then the runtime will be about 25 minutes. 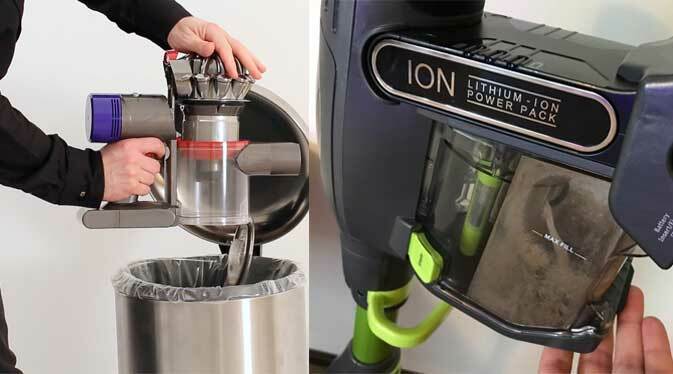 Here, we can see that the runtime is close but you have to keep in mind that the battery of the Shark IONFlex can be removed but the battery of Dyson v8 is not removable at all. However, the Dyson comes with a warranty of 2 years. The Dyson v8 comes with a complete “machine filtration” system so that it can keep the allergens and dirt inside the bin. Shark IONFlex does not bear any HEPA filtration. So, if you have allergies then you should not inhale the allergens. In this case, Dyson v8 will be a better choice. The V8 tops out at 115 air watts as this is one of the most powerful cordless vacuum cleaners in the market. 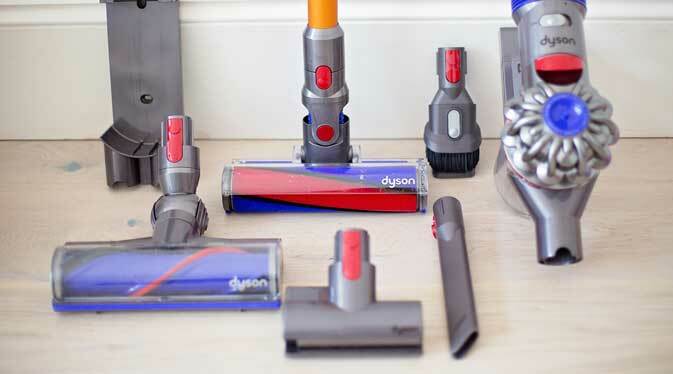 The Dyson upright cleaners will produce about 270 watts. It works perfectly on both bare floor and carpet. As it has a bristle attachment, it can pick up all the dirt from thicker pile carpet. The thing you should like about the DuoClean feature of Shark is the agitation. When it comes to sheer performance, this model is pretty impressive in the thicker carpets also. The mini turbo brush usually does a great job on the swish carpet. In the Shark IONFlex vs. Dyson v8, in terms of the warranty, the Shark wins. The Dyson comes with a 2 years warranty while the IONFlex model of Shark provides a 5 years warranty for the vacuum and a 2 years warranty for the battery. The price difference between Shark IONFlex and Dyson v8 is minor. Both will cost you almost the same. But if you consider the innovation of Shark IONFlex vs. Dyson v8 then we would recommend you to go for Shark as it provides superlative features within the same budget. Why should you go for Shark IONFlex? If you need the IONFlex technology, DuoClean attachment, LED lights, long run time and long-term warranty then Shark IONFlex will be the best bet for you. Why should you go for Dyson v8? If you have an allergy, you need a bigger bin, good filtration method, Motorhead and soft roller head then go for the Dyson v8. On the surface, there is no visible difference between Dyson v8 and Shark IONFlex but if you look carefully then there are some very specific differences that may help you choose one vacuum cleaner. It depends on your own requirement with what you would go for. But, according to us, the Shark IONFlex is superior in terms of the IONFlex technology, DuoClean feature and LED lights.